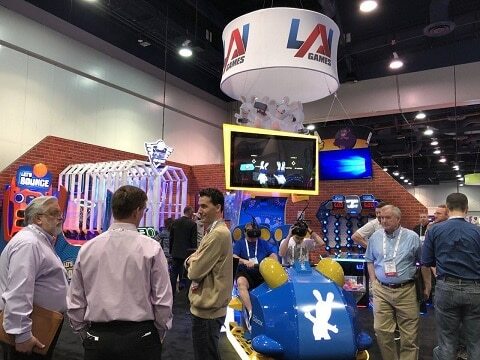 Dallas, April 3, 2019 – Leading game manufacturer LAI Games reports a fantastic turnout at Amusement Expo, with non-stop booth traffic for the duration of the event. Virtual Rabbids: The Big Ride stole the show once again with riders’ hilarious reactions drawing crowds of onlookers. LAI Games also took the great exposure at the show to launch their new online parts store. As a show promotion, LAI Games offered a 10% off coupon code for booth visitors, but because of the great response have extended the offer through April 12, 2019 for anyone who signs up to their mailing list. To get the coupon code, simply subscribe to their newsletter at laigames.com/laigames-insider. Visit their new parts store at parts.laigames.com. LAI Games, a subsidiary of Helix Leisure, has been a leader in the interactive entertainment and game industry for over 60 years. The company develops, manufactures, and sells coin and card operated virtual reality, prize merchandising, video and ticket redemption games, photo booths and novelties. LAI Games is dedicated to bringing innovative and high incoming-producing games to the global market. For more information, please visit www.LAIGames.com.